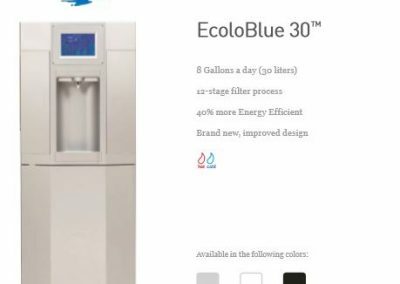 WHAT IS AN ECOLOBLUE ATMOSPHERIC WATER GENERATOR? 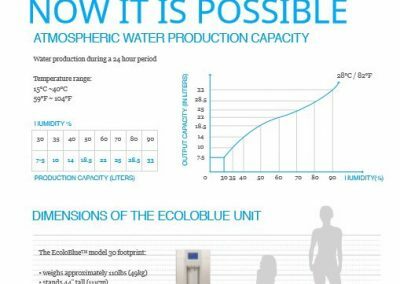 An atmospheric water generator (AWG) is a device that extracts water from the humid ambient air. Water vapor in the air is condensed by cooling the air below its dew point. 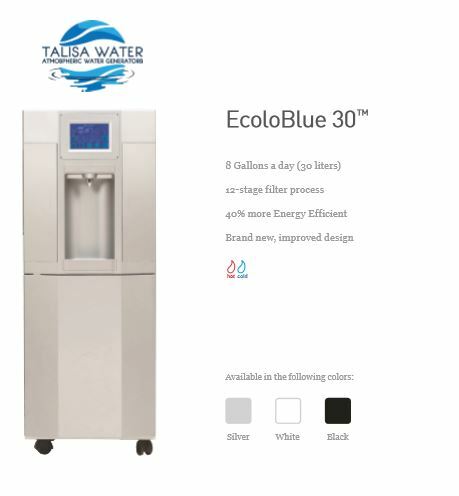 Designed to render the water potable with multiple stages of the filtration system. No more purchasing of bottled water. Minimal amount of energy to produce water. 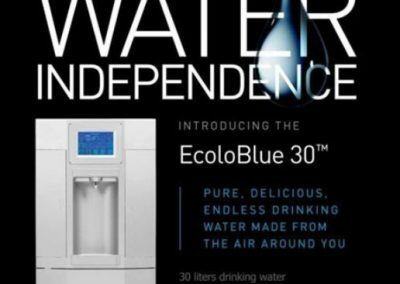 No more driving to grocery stores and lifting heavy bottled water. Protects your expensive furniture from humid environments. Helps reduce the amount of dust, bacteria, and fungus in the air. 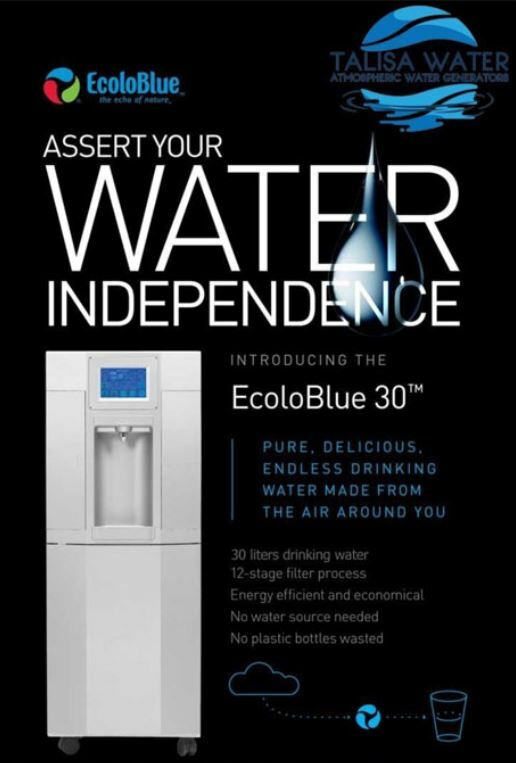 Delivers the purest water and freshest air to your environment. Utilizing high intensity UV (ultraviolet), it eliminates any microorganisms including bacteria and viruses. Operated by a microcomputer control system, it will automatically stop generating water when completely full. 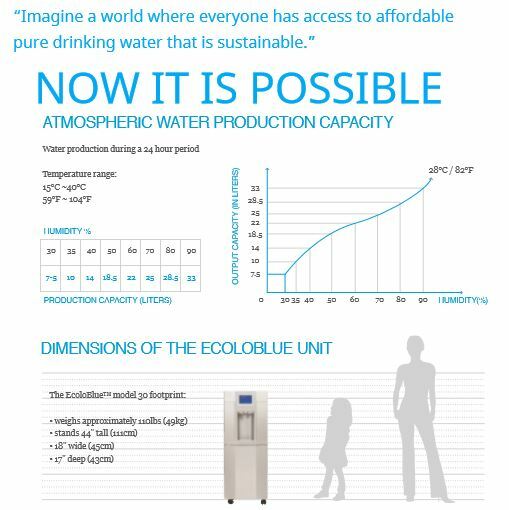 Average cost per liter of pure drinking water is about 6 cents using our Atmospheric Water Generator. No need to spend hundreds or even thousands of dollars for an additional dehumidifier, or air Filters.